Putting this thread here to help us organize for the upcoming raids in Heart of Thorns. I'm not sure of when we're going to attempt our first raid clear, because there is no information on how long it will take to unlock access to the raid yet, but once we get a time frame, i'll try to schedule a raid that doesn't interfere with our WvW weekends if possible. Additionally you will notice that Guardian is not included on this list. As we are unsure of the current damage mechanics inside the raid fights, we do not know if they will be necessary for the content at all. Some testing is needed but I suspect that Guardians will be included for their Aegis rotations to block the periodic AoE damage that hits everyone in the arena; this damage works similarly to Agony but can be dodged, and probably also blocked. If this is the case, at least one Guardian will replace a DPS class. Also to note is the fact that some parts of this raid can only be cleared by using condition damage, because of this we will be pulling some new builds together that maintain the utility of each class but provide better condition damage for the fights where it is needed. This probably does not mean making an entirely new set of gear, but more likely just swapping weapons and some skills/traits. Please be aware of this mechanic and learn how to play the condition variant of your class if you do not already know how. We will do some more detailed build theorycrafting and gearing as we learn more about what we have to bring to these dungeons. For now, though, I would like if everyone could post a rough estimate of when they would be available to do PvE content in the coming months. It is likely that we will not be attempting the raid until November, so keep that in mind. Please make sure that if possible these times do not overlap with our tentative WvW raiding schedule (Late Friday/Saturday). If they do however, we should be able to make things work, since PvE raids will be done less often than WvW content. 24 hours from now I will be posting a list with all of the required classes that we will be bringing to the raid on Friday. Any extra slots will be filled with DPS classes only. If you would like to sign up to attempt the raid with us this week please post tomorrow after I have started the sign-up process. 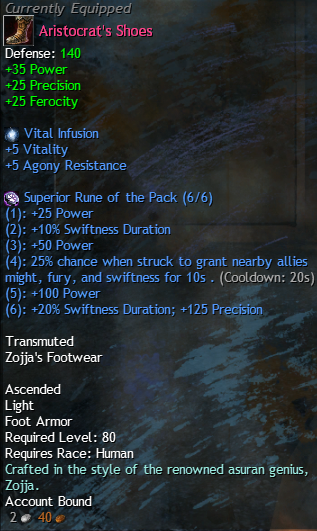 List the class you will be bringing, and its gear stat combo. If you would like to raid but you can only fill one slot which has been taken please make a post detailing which class and role it is that you would like, the slots will be somewhat flexible since some of our members have multiple characters they can bring. Before posting make sure that nobody else has signed up for the spot before you. This sign-up is first come first serve for all positions. We do have more than 10 members willing to attempt this raid, and so I cannot promise everyone a spot on the first one, this is why I'm making the announcement 24 hours beforehand. Finally, all players attempting this raid MUST bring PvE builds and PvE gear, no exceptions. Raiding is not a casual experience, and we will likely fail even if everyone is geared properly, so bringing World vs World setups is a detriment to the entire composition. Also, you must have Basic Gliding and Updraft masteries to participate, this only requires mastery rank 3 and should be attainable by everyone before friday. In approximately an hour and a half sign-ups will be going up for our Friday PvE raid. This post will have listed in it some last minute reminders and tips for raiding, and also will detail the builds we will be using. 1. If you are in the raid you must use a PvE build with appropriate gear. 2. There is no excuse for running any consumables other than what is best in slot for your build, you could potentially be making a few hundred gold if we end up killing even just the first boss. Foot the bill on food, otherwise you are hurting 9 other peoples chances at success. 3. Please have a basic understanding of how the Vale Guardian fight works. I will briefly explain it when we initiate the raid, so please pay attention. 4. Raids are not dungeons. They are much more difficult by design. We will die, we will fail, probably multiple times. Do not afk auto attack the boss otherwise you're dead weight. Every class has skills that provide higher DPS than their basic auto attack except Revenants. 5. Finally, don't get frustrated if we do fail the boss encounter multiple times. Only very few of us have even experienced this content at all, and those of us who have still possess very little knowledge of the fight first-hand. Raids are historically content that cannot be beat in one try, and I am not expecting us to beat it the first try, or even in the first night. Have fun playing the new content, it is a game after all. Below is the list of classes we will be taking for our raid attempt, I would like to stick as closely to this list as possible, conflicts in what classes people are able to bring can be resolved this week. Just a reminder, this list is first come first serve, and I cannot guarantee everyone a slot in the raid, although I may be able to grab people to fill slots depending on how long we attempt the raid. If someone leaves I will do my best to put someone else in who can provide similar support to the group. The squad will be divided into two teams. This is only to spread boons evenly between all 10 members. Your specific role will be assigned to you on the day of the raid depending on who has signed up. *As a note, our Reaper will be taking tanking responsibility by default, I understand it to be the case that we have two different people who are willing to tank for the group, and if one of them brings a guardian, that guardian will take over the tank role. This specific spot may change hands during the week. Please post below which role you wish to sign up for. I will update the list periodically until Friday to reflect which roles have been filled, and I will also be adding names of guild members who do not have forum accounts and sign up by contacting me through game or in teamspeak. Finally, due to some bugs with how player controlled summons interact with heals and boons currently, the Druid and Chronomancer, or Reaper may switch parties to the one they are not currently in. Thank you for being patient in waiting for this post to go up, it is a day later than I intended, but we should have plenty of time to get organized before Friday. COUNTDOWN TO RAID, please try to be an hour early if possible for pre-organization! I will be available for raiding tentatively most evenings (school will override this at times). Because of work and school, bedtime is typically midnight of any given day of the week save Sundays and Tuesdays. I can provide all stat and build variants of Engineer. I will potentially gear and learn either Warrior or Rev depending on the need after I polish up the Engi. Can provide my services as Warrior, Elementalist, Mesmer, or others depending on what the expansion itself holds. Schedule in a month when this content is available, however, is entirely up in the air. Due to us being from all over the place I would think a Friday evening before reset may be a decent time to try? I can bring whatever is needed but prefer ele. Friday before reset would work for me. Ideally 2 or 3 hours before reset. I'm available most US timezone evenings. I'm only available for long dungeons on Friday nights and Saturday nights. I'm in the same boat as Aiden. Someone compiled a thread for average compilation of succesful raids. AS for what I can play I'll just fill w/e we need. Although i'm more comfortable with heavy/light classes I am setting up a viper engi as well.